Since our start with educational wooden models in 1948, Tamiya has unswervingly striven to be "First in Quality Around the World". This refers not only to quality with respect to products, but also to our dedication to the hobby industry as a whole. From the planning, design, mold construction, molding, and packaging to the various forms of grafic design found on the packaging, assembly manuals, etc., Tamiya's in-house manufacturing process allows for attention to detail indispensable for the pursuit of hobby excellence. Tamiya supplied a line of plastic kits and electric radio controlled models of the Alfa Romeo 155 V6 TI respectively in scale 1:24 and 1:10. Supply of the 1:24 plastic kits was discontinued, but Tamiya decided to re-release these models. Photo courtesy of aleg85 at gennamodel85.wordpress.com. Photo courtesy of cmwatson at flickr.com. 1. Tamiya, Inc.: About Tamiya; 2009. 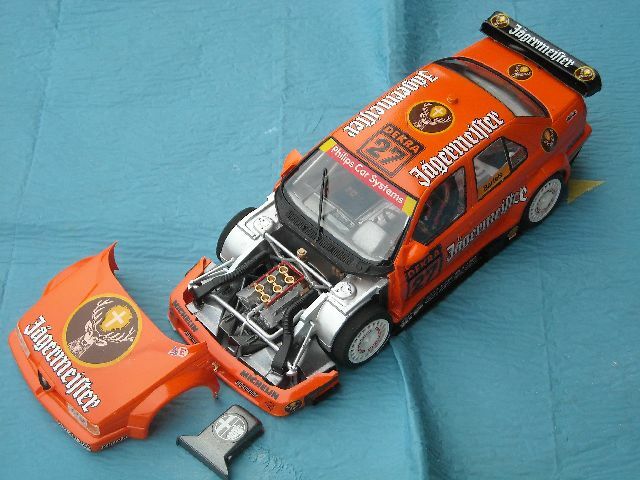 Miniature, literature and memorabilia - forum "Alfa 155 Club"